While I was browsing through the photos I made this year and stumbled upon this Polar Bear & floss pic. The cool palette suits the current weather conditions perfectly as we had our first snow of the season today. Much to the amusement of my kids (snowball fights) and the cat (watching snowflakes from her comfy and warm spot on the kitchen radiator). 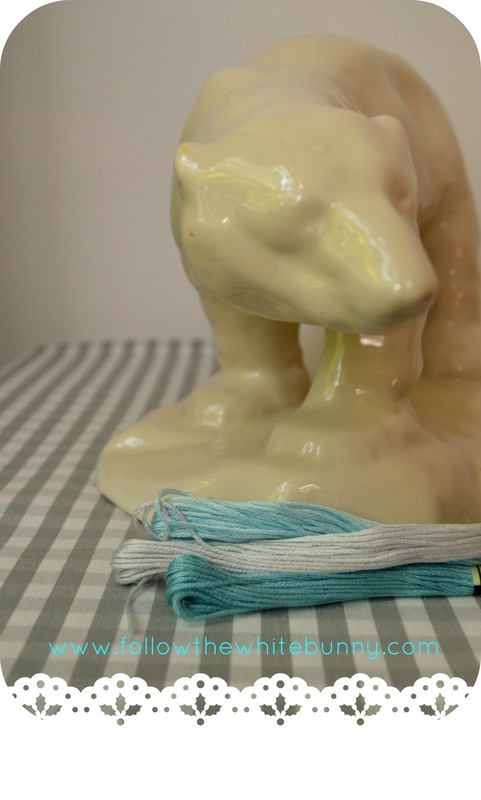 I made the Polar Bear photo for the Scandinavian Issue of &Stitches (available here!) for our 'Colour by Numbers' feature, but we chose to use the other picture (the Danish Teacup you see in my header) I made. Anyway, the top one of the six-stranded flosses in this photo is a favourite of mine. No. 747 is one of the most wonderful icy blue colours DMC has to offer: a cool blue with a hint of mint... The floss in the middle is a subtle silvery grey colour (DMC 762) and the mid shade of blue is DMC 598. 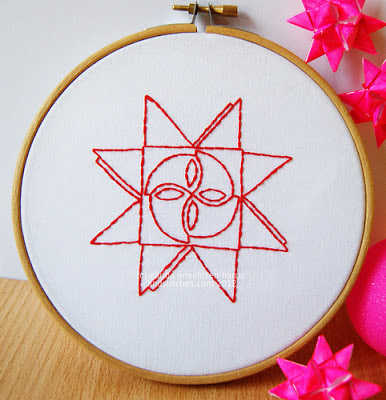 And if you are looking for a project to use these shades, check out this wonderful free 'woven' star pattern Carina posted on the &Stitches blog. I have a winter-y freebie pattern on the &Stitches blog early next week. Wishing you all a fun and crafty weekend! I didn't know if your e-mail on your profile is active but I really loved one of the pieces on your site and I featured it in my blog to promote you! I definitely find your embroidery inspirational~ Keep up the great work!